Fireworks are set off during the opening ceremony of the 2018 Winter Olympics in Pyeongchang, South Korea, Feb. 9, 2018. In an extraordinary show of unexpected unity, North and South Korea sat side by side Friday night under exploding fireworks that represented peace, not destruction, as the 2018 Winter Olympics opened on a Korean Peninsula riven by generations of anger and suspicion. The sister of North Korea's leader, Kim Jong Un, shook hands with South Korean President Moon Jae-in - and appeared genuinely pleased - while they watched an elaborate show of light, sound and human performance. Minutes later came a moment stunning in its optics and its implications: the United States, represented by Vice President Mike Pence, sitting a row ahead of Kim's sister and the North's nominal head of state, all watching the games begin _ officials from two nations that many worry are on the brink of nuclear conflict. 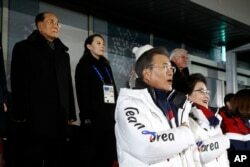 South Korean President Moon Jae-in, second from bottom right, stands alongside first lady Kim Jung-sook as the South Korean national anthem is played at the opening ceremony of the 2018 Winter Olympics in Pyeongchang, South Korea, Feb. 9, 2018. 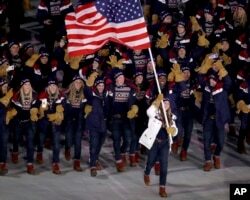 After years of frustration, billions of dollars and a nagging national debate about their worth, the opening ceremonies took place before a world watching the moment not only for its athletic significance and global spectacle, but for clues about what the political future of the peninsula could hold. 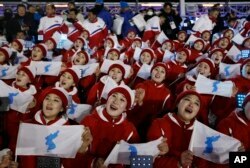 A delegation from North Korea, dressed in identical garb and cheering in careful coordination, watched from an upper deck of the stadium. Then began the Olympic tradition that takes place at every games - the march of athletes from the world's many nations, girded against a frigid Korean night and temperatures that dipped below freezing with biting winds. "Athletes from the two Koreas will work together for victory, and that will resonate with and be remembered in the hearts of people around the world as a sign of peace,'' Moon said in a reception ahead of the ceremony, according to his office. Will the Russians who aren't Russians - the 168 who have been invited as "Olympic Athletes from Russia," competing in neutral uniforms under the Olympic flag - bring home gold? Will Patrick Chan of Canada hit his quad jumps and claim figure skating glory? Members of the North Korean delegation hold flags of the combined Koreas before the opening ceremony of the 2018 Winter Olympics in Pyeongchang, South Korea, Feb. 9, 2018. Children perform during the opening ceremony of the 2018 Winter Olympics in Pyeongchang, South Korea, Feb. 9, 2018. Could Pyeongchang's initial pitch - that it could contribute to peace on the Korean Peninsula - actually become reality? The opening ceremony will offer at least some hints about that, and maybe more. What's certain is that these Games, more so than any in recent memory, are about far more than sports.